Google (GOOGL) and Facebook (FB) mainly sell ads or, put another way, sell us to ads. That is their main business. The two companies compete on US soil as well as outside the American landmass. In fact, their primary market used to be the US, but for the past four to five years, their main market, in revenue terms, has been abroad. Investors looking to see where FB’s and GOOGL’s growth is coming from should take a look at what is happening in their international markets as opposed to concentrating on the moonshots. That is not to diminish the potential upside that their moonshots have but in reality those projects will not be coming to market and much less contributing to the bottom line in the near term. In the long term they may start to yield a return but for now they are exactly as they are named, moonshots. How will these companies grow to produce the revenues that fund the moonshots? International markets. So if we are looking to choose the better stock between the two, at least for the medium term, then international markets are where we should look. This is what I will do in this article. Google also has similar trends for some of its products, e.g. 80% of YouTube’s views are from outside of the US. 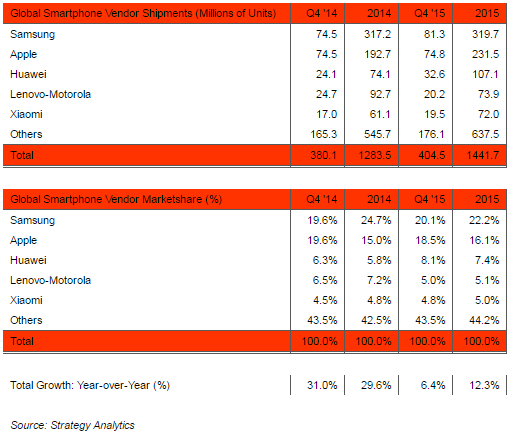 Additionally, Android is still the dominant mobile operating system in a large part of the world. So international markets are a critical part of these companies’ future growth strategy. Bears will be quick to point out that, although international markets present tremendous growth potential, they are usually in low-income countries where the average revenue per user (ARPU) is lower than in higher income countries. This is largely true, but that is why capturing a bigger market share abroad is so essential. Economies of scale are more important in international waters because of the low ARPU. Ultimately, the international market may turn out to be a field where the winner takes all. So if international markets are the space where near-term growth for these advertisers lies, what are they doing to capture that growth? How are they doing so far? Digital advertising is great; however, you can’t advertise online to people without an internet connection and it’s hard to do so for people with slow connections. Billboards are a low-tech possibility but thankfully that is neither company’s plan. Instead meet Project Loon and Internet.org. Project Loon is Google’s attempt at tapping international markets by providing a wireless connection via hot-air balloons. The idea is to choreograph a group of balloons (through winds in the stratosphere) that will create a network that can provide an LTE connection. The idea is bold but on its own would not be enough to secure a lion’s share of the international market. So Google also plans to use drones to deliver an internet connection in disaster areas and to supplement the balloons in high demand areas. Then, there is fiber; Google’s cable solution to improve internet speed and television. But fiber has been concentrated in the US so it doesn’t count much towards increasing international market share, although in the future it may. Furthermore, there were rumors that Google was planning to use satellites to improve internet access abroad but Terra Bella —Alphabet’s satellite subsidiary—has mainly been focusing on satellite imagery not internet access. Overall, Google’s attempts at increasing internet access abroad, which would allow it to boost its search business there, have been less than concerted. Internet.org is Facebook’s strategy for increasing its reach abroad by, for example, providing access to certain websites without data charges—aka Free Basics. This strategy has expanded to include using unmanned aircraft, satellites and lasers to improve internet access and speed. However, the approach has been met with resistance, mainly because of Free Basics. For instance, Facebook was forced to pull Free Basics out of India after India’s telecom regulatory authority blocked it for violating net neutrality. In addition to Internet.org, Facebook has recently partnered with Microsoft (MSFT) to build a cable across the Atlantic. The high speed fiber cable, named MAREA, will connect the US to Southern Europe and network hubs in the Middle East, Africa, and Asia. The cable will help Facebook (and Microsoft) deliver information much faster and more reliably. Overall, Facebook’s approach to improving internet access abroad, especially the building of MAREA, seems much more determined than Google’s for a couple of reasons. First off, and to state the obvious, cables are much more reliable than balloons or satellites. Even though Google is also laying cable through fiber, it is mainly doing so in the US not international markets. Google has invested some in undersea cables abroad, although its most recent was to Japan (not where the majority of people without internet are). While the strategy of laying fiber in high-ARPU areas like the US may be sound, it also presents additional competitive challenges from telecom veterans Charter, AT&T and Comcast. Secondly, Google’s balloons and drones face large regulatory hurdles in getting transmission frequencies changed or repurposed and getting security clearance. Facebook is using drones as well, and satellites, but not balloons. The major advantage of having all those phone manufacturers use Android is that the phones they make come with most of Google’s products such as the Chrome browser pre-installed. The preinstalled products help Google maintained its primary business—search. Consequently, Google is able to preserve its lead in advertising. Given the rapid uptake of smartphones and tilt towards mobile advertising, Google stands to dominate in mobile search/advertising even if doesn’t do much to increase internet speed and access in international markets. But Google’s position isn’t entirely secure. The phone manufacturers have been working on their own operating systems. For instance, Samsung replaced Android with its own OS, Tizen, on its Gear smartwatch. Nonetheless, most of the manufacturers have a strong incentive to continue using Android for their smartphones because of its good app ecosystem (usually the success of phones depends on how good their app stores are, but more on this later). The major threat to Google’s position would be Apple because it has a very good app store. However, the iPhone’s high price point is Apple’s Achilles heel in international markets. The most important growth market for smartphones in the last few years has been Asia, at least if Apple’s and Huawei’s sales are anything to go by. Since 2011, Japan and China have traded spots as the fastest growing regions for Apple. Even in Q2 2016 when iPhone sales started to slow, Japan posted gains as result of higher service sales. In 2015, Asia contributed 38.3% to overall revenue, almost equaling the US’s contribution at 40.2%. The smartphone growth Asia is experiencing translates into more people getting online and greater numbers using Google and Facebook’s services. 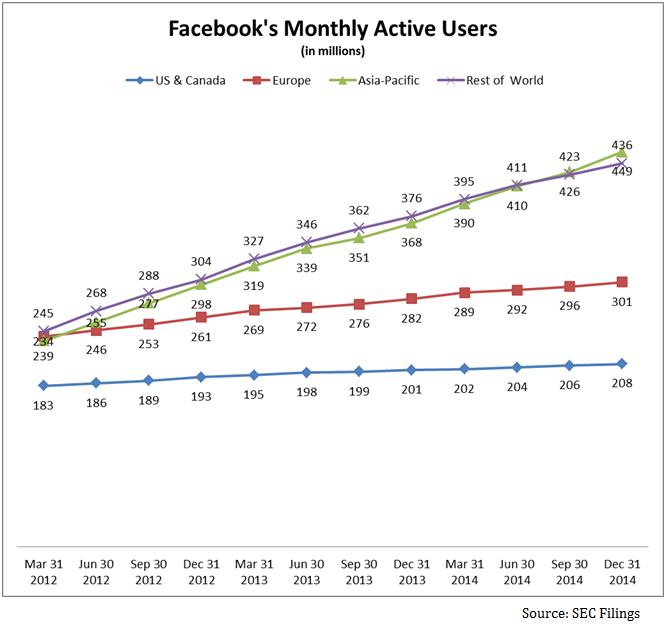 The great smartphone uptake is reflected in Facebook’s monthly active user growth as shown in the chart earlier. Given that most of Google’s and Facebook’s products are blocked in China, the available prime markets in Asia are India and Japan. Android is the dominant operating system in India while Facebook is the most popular social network there. While Facebook is dominant in social media, it is not as dominant as Google is in search (there is no competing search engines like Baidu, Naver, or Yandex in India). Additionally, there are still questions about how Facebook will monetize WhatsApp—which gets a good chunk of its user base from India—but more on this later. In Japan, Apple’s iOS is the dominant smartphone OS at 56.8% of the market, with Android coming in a close second at 51.7% according to Kantar. But even on iOS, Google is still the default search engine and is willing to pay to keep it that way. The bottom line is that Google is far more dominant in Asia than Facebook is. Android is the second most popular mobile OS in Japan, it is widely used in China even though most of Google’s products are blocked, and it is the undisputed king of search in India. Facebook, on the other hand, is still behind Mixi in Japan and is facing competition from Line; it is dominant in India but still has a WhatsApp problem, and it is blocked in China. Let’s take a look at the products being offered abroad but not currently being monetized. Monetizing the product abroad is more so a Facebook problem than it is Google’s. Google already monetizes most of its primarily offerings abroad i.e. Search, Android and YouTube. Its other products e.g. the Chrome browser are mainly supplements to the core business, Search. Similar to Google, Facebook already monetizes two of its primarily products, the Facebook and Instagram apps. However, the other two, Messenger and WhatsApp—especially WhatsApp—present problems in being monetized abroad. Let’s focus on WhatsApp because it is far more popular abroad (since that is the focus of this article) than Messenger. WhatsApp was initially monetized on a subscription basis—free for the first year but $0.99 per year after that. After being acquired by Facebook, the subscription model was done away with because that is not where the big bucks are and not many of its users have credit or debit cards. The monetization plan for WhatsApp is slowing morphing into something similar to that for Messenger i.e. using WhatsApp “to communicate with businesses and organizations that you want to hear from.” Sounds like a good plan. Plus encrypting WhatsApp end-to-end was a great step in that direction. But there are several holes in this plan. One, many users use WhatsApp for cross border communication. What good are local restaurant suggestions to people 3000 miles apart? Two, who wants to talk to their bank on WhatsApp? I would guess not many. Especially given that many of WhatsApp’s users don’t have credit or debit cards. These questions in no way suggest that that monetization plan won’t work. They mainly serve to highlight the nuances that WhatsApp will have to take into account. In addition, to the above strategy, there other ways WhatsApp can be monetized; calls and money transfers are some of them. Charging for calls seems natural given that WhatsApp is primarily a mobile platform and it has a calling feature but its faces a lot of competition from Skype and Google Hangouts. WhatsApp would have to provide better call quality at an affordable rate especially to countries low-income countries where mobile calling rates tend to be higher. The other and perhaps more lucrative market to go after would international money transfers. People talking to their families abroad usually also send money them money. WhatsApp could enable communications between users and money transfer firms, e.g. Western Union, or get into the transfer business itself. Ultimately, the monetization strategy may end up being a combination of all of the above. At the end of the day, while Facebook worries about how to monetize WhatsApp and Messenger, Google is currently making money on Android (dominates the international smartphone OS market), YouTube (80% of views coming from abroad), and Search (leading most search engines). Its monetizing strategy doesn’t require much tinkering beyond improving search results in local languages. Both Facebook and Google are facing increasing scrutiny from regulators, but Google more so than Facebook. Additionally, scrutiny on Facebook has mainly been on less financially harmful issues like bias in its news feed or the inability to provide information to law enforcement, while scrutiny for Google is on bottom-line-altering issues like antitrust. It is hard to predict the outcomes of these cases (which usually last years and may be influenced by political factors) or know whether Google has really prevented manufacturers from running competing OSes. Nevertheless, we know that the success of phones is usually based on what they can do (read: apps) as evidenced by the Fire phone’s flop and the success of the iPhone. If manufacturers are preinstalling Google apps, it is very likely because they are good apps and have a good eco-system around them (Play Store). This is the question the EU is asking: has Google, knowing that manufacturers’ phones need its Play Store to succeed, exploited the manufacturers to make Google Search the default engine? We’ll have to wait and see. But in the meantime, this presents a strong headwind for the company because of the large fines it may end up facing. Google is trading at 31 times trailing earnings while Facebook is going for 70 times earnings. The story is similar on most metrics; for instance, Google is trading at 29 times Free Cash Flow (FCF) while Facebook is trading at 49 times FCF. Additionally, given the rally Facebook has been on in recent months—breaking $120 around mid-May—it has been getting overextended and is due for a pullback. Although both are probably great long term plays, Google at the moment offers a better entry point than Facebook. Both Google and Facebook are dominant in their own right, but Google more so than Facebook. Even though Google’s effort to bring more people online may be less concerted than Facebook’s, it dominates the smartphone OS space, effectively controlling what people (even those just coming online for the first time) use to connect to the internet. Additionally, although phone manufacturers would like to replace Android with their own OSes, the difficulty of developing a good app ecosystem—which is a big factor in how well their smartphones sell—disincentivizes them from doing so. In the prime international markets (for instance, in India), Google faces slightly less competition than Facebook and doesn’t have a monetization problem, as it is already monetizing its prime products abroad (search, Android, YouTube), while Facebook, although monetizing Facebook and Instagram, still has to figure out how to monetize Messenger and WhatsApp. The major threat for Google abroad has been and will continue to be antitrust concerns by regulators. This will be a serious headwind for Google; however, given the lack of competition in most international markets, it will continue to be the dominant search engine. Keep in mind that so far we’ve only been talking about international markets; if any of Google’s moonshots actually land, the potential upside— at this valuation—will be tremendous. 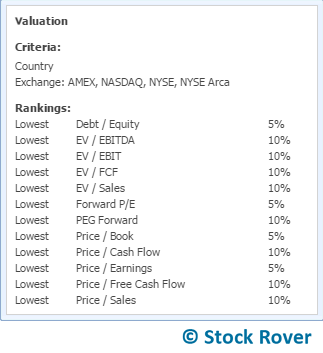 GOOGL is in our Large Cap Capital Appreciation Portfolio, which you can get from the Library.